The last blog left off when we were walking around Puerto Madero. We were pretty tired and only had a little of time before our bus ride so it was hard for us to decide whether we should go to La Boca or not. Eventually we decided to just do it, so we caught a cab and headed to La Boca. This neighborhood is known for its colorful buildings and huge soccer stadium. 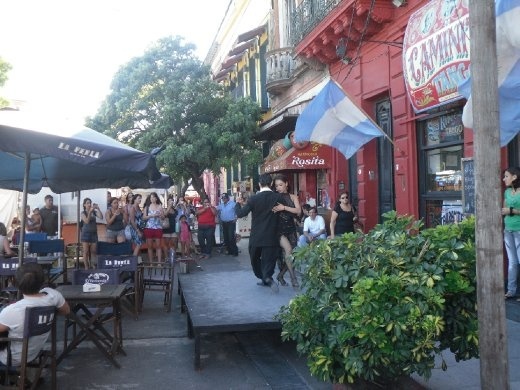 It is a super touristy area with tango shows in front of every restaurant on Caminita. Brett and I wanted to walk by the stadium so we turned off of the main street and headed away from the main tourist area. We passed the giant blue and yellow stadium and the next thing I knew I felt someone pulling our camera out of my hand. As soon as I realized what was going on, I screamed “no!” and tried to keep my hold on the camera. Next thing I knew, the camera fell to the ground and one of the four guys who were trying to rob us scrambled to pick it up. As soon as he got it, Brett surprised me by attacking him and fighting him to the ground. 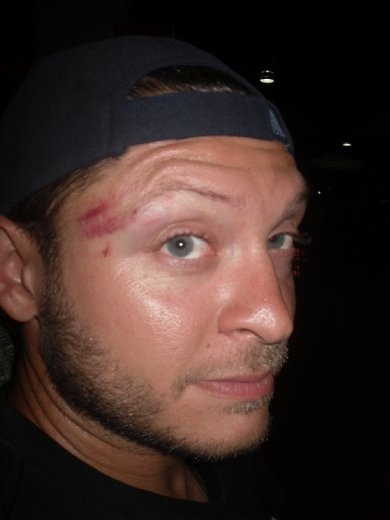 One of the guys punched Brett to help his friend get away and then they all made a run for it. Brett chased them down the street and was right behind them when he tripped on the sidewalk and fell to the ground. The worst part was he scratched his knee and his tattoo that he’d just gotten the day before. The guys got away and we were stunned. Brett had been so close to catching the little juvenile delinquents (age 19 we found out later). This was the first problem like this that we’ve had in 6 months of traveling and we were so bummed to lose our camera. We were walking around in shock and looking for a place to sit down and calm down. Just minutes before we were talking about how cool it would be if we saw the kids walking around, we saw them again! We were walking in different directions on the same street! When we saw them we thought it was them but we weren’t sure so we started walking towards them to get a better look. The kids started looking nervous and turned around and started sprinting in the opposite direction. Brett turned to hand me his glasses and told me to wait there and that he was going to go after them. The boys had about a 50 foot head start, but I could tell that Brett was determined to get his hands on one of them. He was gone and a minute later I started wondering what I was still standing there for and started running down the street after them. I could see all of them ahead of me, but it wasn’t looking like I had a good chance of catching up so I started walking. Just when I stopped this old man in a CSI tank top and a big beer belly comes out of one of the shops and asks what’s going on. I let him know what the situation is and he starts running in the direction of Brett and the kids. I start running with him to let him know where to go. We turn the corner and all the people are up in arms out in the street. They tell me that Brett chased the robbers into the supermarket and they haven’t come out. CSI and I run over to find Brett, about 3 blocks away from where we first saw them, holding one of the kids in a choke hold right at the door of the store. The kid was already looking a little beat up and Brett was yelling “call the police!” (in Spanish of course) while all the people in the packed store were standing at the checkout watching the whole scene in shock. We couldn’t see that the kid had the camera and were thinking that one of the other kids probably had it until we lifted up his shirt and there it was tucked into his pants! We definitely lucked out that Brett caught the one that actually had the camera, because the other 3 had run away. The kid was trying to get away so Brett brought him to the ground to get a better hold on him. The kid was yelling “he’s crazy, get him away from me!” and all of the sudden CSI starts shouting and kicking the kid in the stomach. Suddenly the police came running up and took over from there. They flipped the guy over and threw cuffs on him. The whole time he was yelling about how crazy Brett was. While I was giving my statement to one of the cops, the boy’s mom came into the station screaming at the officers who had put her boy under arrest. I think it’s far too common for parents to defend their kids when they are obviously in the wrong and this was just another example of this ridiculous phenomenon. We had been in the station for about an hour and a half when we realized that if we didn’t leave soon then we would miss our bus for Puerto Iguazu. We asked the officers if they had any more questions and gave them our email in case they needed more information. We left and caught a cab first thing just because we knew it probably wasn’t safe for us to be cruising around the neighborhood with the other 3 kids still on the loose. We made it back to our hostel to get a sandwich from our favorite little restaurant and picked up a bottle of wine for the bus. We grabbed our bags and jumped in a cab, but when we got to the bus station we got a bit of bad news. Our bus had been delayed and would be leaving six hours late! Instead of leaving at 9:30pm, we departed Buenos Aires at 3:30am happy that our only losses of the day were a chips sunglass lens, a cracked camera screen and Brett’s small injuries. It was a bummer that his tattoo got scratched, but he’s got a pretty good story to tell every time someone asks him what happened to it. I cringe everytime I hear this story, it could have ended so different but I know Brett used good judgement knowing they had no weapons! Way to protect your property and your lady Brett! We really liked your story and wanted to share it with the World Nomads community so that others can enjoy it too. Check it out on the WorldNomads Adventures homepage this week.